If you suddenly start eating fiber-rich foods -- such as fruits, vegetables and whole grains -- you may develop messy stools that are loose and watery. MedlinePlus states that most side effects of eating a diet high in fiber subside within three days. If your messy stools continue for more than three days, call your doctor to discuss your symptoms. Certain medical conditions may trigger diarrhea from eating high-fiber foods. Fiber is the part of plant-based foods that the body cannot digest or absorb. When you ingest foods, your digestive system breaks down fats, proteins and carbohydrates to use for energy. The portion of the food that remains undigested is fiber. Fiber helps maintain bowel regularity and is commonly used to treat constipation and high cholesterol. Harvard School of Public Health states that the average American should ingest between 20 and 35 g of fiber daily, but most people only eat about 15 g. Fiber is sold in supplements but is most effective if consumed in your diet. Fiber-rich foods are mostly fruits, vegetables and whole grains. Fiber is categorized as either soluble or insoluble. Soluble fiber absorbs water during digestion and develops into a gel-like substance that helps soften your stool. Common foods that are high in soluble fiber include beans, apples, carrots, barely, psyllium, citrus fruits, peas and oats. 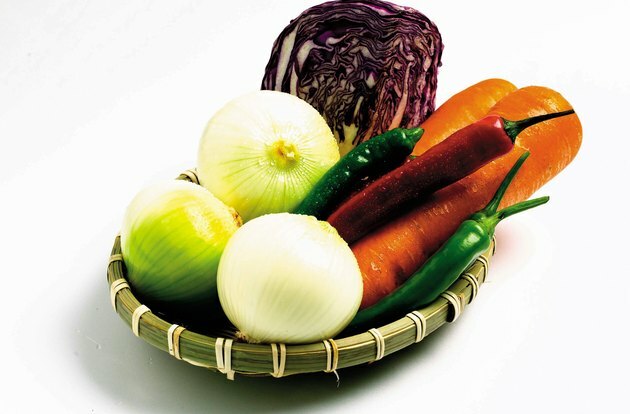 Insoluble fiber can help people who struggle with constipation or irregular bowel movements. Common sources of insoluble fiber include wheat bran, nuts and broccoli. Loose and watery stools are most likely the result of adding fiber too fast into your diet or consuming too much fiber on a daily basis. MedlinePlus explains that when you increase the amount of fiber in your diet, you need to slowly introduce the fiber to prevent negative side effects. Common side effects include bloating, gas and stomach pains. Eating excessive amounts of fiber may also prevent your body from absorbing certain nutrients. Certain digestive conditions -- such as irritable bowel syndrome, Celiac disease or Crohn's disease -- can cause excessive diarrhea from eating fiber-rich foods. If you notice blood in your stool or you develop diarrhea every time you eat certain fiber-rich foods, call your doctor. Diagnosis of your condition may result in proper treatment to prevent further complications.